Landscape design, building, and maintenance are often separate disciplines. But at Rainbow Acres Landscaping, we consider them as one. The one who designed the landscape will know better how to build and maintain it. Getting different people to do these three different but related jobs will only be costlier, consumes more time, and will be a lot more stressful. Why suffer all these when you can get one experienced, skilled, and creative company to do everything for the landscape? What makes landscape design challenging is that it has to combine art and practicality as well as culture and nature. So it is more than just planning how the landscape will look like such as where to place the gazebo, the fountain, the waterfall, or the view deck. 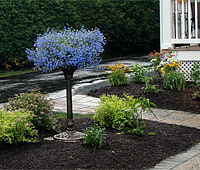 Landscape design should also involve plants and how they will be placed within the area. Now all these elements must be combined harmoniously to create a likeable and healthy environment that’s also comfortable and functional for the users. That is why for us, a landscape design is more than just planning how to beautify the outdoors. It is also planning how to make the outdoors an extension of your indoor living space. Half of t/he landscape building is dependent on the design. That’s because it simply follows the blueprint. 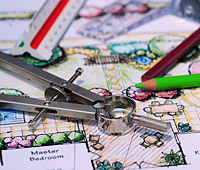 Although landscape designing does not require a lot of labor, it is still the most critical part of the process. But building must be done with great craftsmanship because without this, a great design will never materialize. The Rainbow Acres team is composed of people who are professionals in every aspect of construction. We are experts at laying down pavers, building irrigation system, strategic placement of plants, artistic installation of lights, and many others. But our expertise will never be fruitful without our complete set of machines, equipment, tools, and products. Our team is also disciplined and has respect to everyone and everything. We show this by leaving your outdoors clean and organized after the long and messy landscape construction. No matter how good the craftsmanship is and how high the quality of products used, landscape maintenance will still be necessary. Plants will grow to the unlikeable point, bricks might form unwanted characters, water features will soon grow algae, and ugly grasses will appear. All these and more changes in the landscape are inevitable. But the good news is, they can be well-managed. That’s landscape maintenance. The goal of landscape maintenance is to keep the environment attractive, safe, clean, and healthy. Enough knowledge and skills as well as the correct supplies and tools are necessary to ensure high-quality maintenance. This involves but not limited to adding garden accessories, improving plants and topsoil, adding or improving irrigation system, caring for the pool, fencing, light addition, shrub and topiary pruning, driveway and path maintenance, snow removal, lawn care, fertilizing, weeding, and annual harvesting and planting. Designing, building, and maintaining landscape in Vermont should be done only by professionals like us. We are the best team for the job whether you are in the Essex Junction, Vergennes, or Middlebury. Contact us today and we will frame the perfect plan for anything that your landscape needs.